The MOTU 112D is an incredibly flexible device. A digital audio interface, router, format converter, and stand-alone mixer — all in a roadworthy, rackmount 1U chassis, the 112D connects to your host computer through ultra-fast Thunderbolt technology, AVB Ethernet, or class compliant, high-speed USB 2.0 (with USB 3.0 and iOS compatibility). The 112D rocks 24 channels of AES/EBU digital I/O, 24 channels of ADAT optical digital I/O and 64 channels of MADI — that’s a whopping total of 112 simultaneous digital I/O channels! 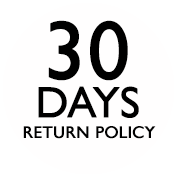 Freely route anything, anywhere — all with near-zero latency. There are tons of cool ways to use the MOTU 1248 hybrid audio interface, ranging from modest one-room studios to multi-room production houses or full-blown live-sound applications. 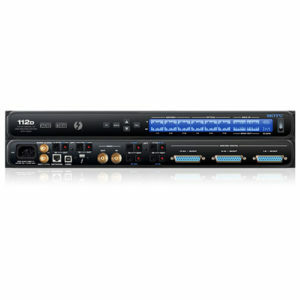 However you put your 1248 to work, we’re sure you’ll appreciate its exquisite sound quality and extremely flexible I/O. In all, you get 32 inputs and 34 outputs, including a flexible 8 x 12 analog section. Four stellar MOTU preamps provide clean and clear amplification, and extremely high-speed Thunderbolt connectivity makes latency a total nonissue. Onboard the 1248 you’ll find a powerful DSP mixer complete with effects, EQ, and dynamics. 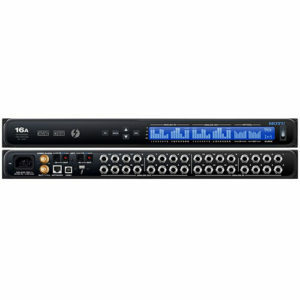 MOTU AVB Ethernet lets you network multiple interfaces to your 1248, and advanced capabilities even let you use it as a standalone, iPad-controlled digital mixer. 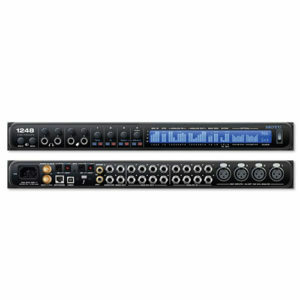 With 16 balanced analog inputs and outputs, the 16A serves as an excellent conduit for your outboard microphone preamplifiers and other studio gear, and an additional 16 channels of ADAT I/O on optical ports provide you with plenty of expansion for multi-channel mic pres and more. Thanks to its Thunderbolt connectivity, latency is no hurdle for the 16A, though the onboard DSP mixer offers latency-free routing for monitoring and mixing. MOTU’s AVB Ethernet lets you network multiple AVB interfaces to your 16A, and advanced capabilities even let you use it as a standalone, iPad-controlled digital mixer . 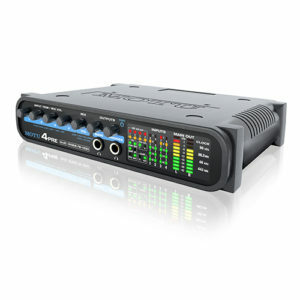 MOTU 24Ai USB 2.0 audio interface gives you the high channel count and low latency you need. Like the rest of MOTU’s popular AVB-equipped audio interfaces, the 24Ai lets you send a ton of audio across a standard network. The internal mixer also includes all kinds of DSP processing, summing, and routing options too, and between its high-speed USB 2.0 connectivity and additional 24 channels of ADAT optical I/O, you can easily expand the capabilities of your MOTU 24Ai. 24Ao lets you send a ton of audio across a standard network and get low latency, high quality, and powerful DSP mixing options. This 24Ao was designed with line-level output in mind, and it’s 24 channels of analog output are ideal if you need to send audio to your front-of-house mixer, your studio processing rig, or your analog summing amplifier. 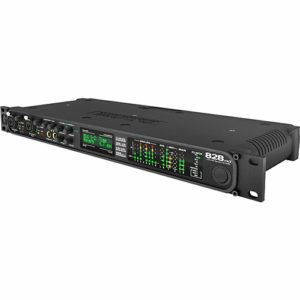 The internal mixer includes all kinds of DSP processing, summing, and routing options too, and between its high-speed USB 2.0 connectivity and additional 24 channels of ADAT optical I/O, the MOTU 24Ao fits into any kind of audio rig. Portability, flexibility, and convenient simplicity – MOTU’s 4pre hybrid recording interface gives you all of this and more. Whether you have a FireWire-equipped Mac laptop or a PC tower with USB ports, recording with your MOTU 4pre couldn’t be easier. Like the name suggests, the 4pre sports four studio-quality microphone preamplifiers. What’s more, each input features a combo jack, giving you inputs for your mics, instruments, and line-level sources. And housed in a handy all-metal half-rack chassis, the MOTU 4pre is ready to go where the music takes you. 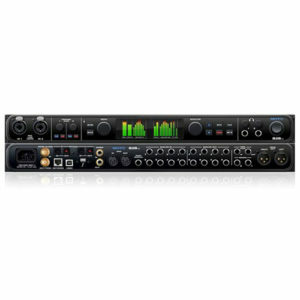 The MOTU 624 hybrid audio interface packs high-end sound, ultra-low latency, and generous I/O into a portable half-rack unit. ESS Sabre32 DAC technology delivers an impressive 123dB of dynamic range on balanced, DC-coupled analog outputs. Experience round-trip latency as low as 1.6ms at 96kHz via Thunderbolt and 1.9ms via USB. 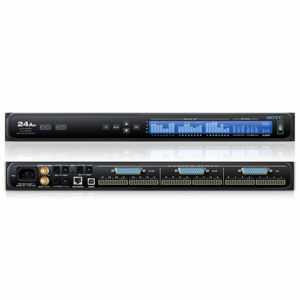 32 total channels of audio I/O make connecting your instruments, microphones, and outboard gear easy. An onboard DSP mixer provides latency-free routing, along with an array of powerful digital effects. Use the 624 as a standalone mixer, or control it wirelessly from your tablet, smartphone, and laptop. With the 828es, MOTU’s legendary audio interface has been retooled with an ESS Sabre32 DAC and dual full-color displays. This interface delivers pristine audio playback, with an outstanding 123dB of dynamic range. Its recording performance is just as impressive, with round-trip latency as low as 1.6ms at 96kHz. A superb complement of I/O includes 60 simultaneous audio channels, two great-sounding mic preamps, a range of digital options, and AVB networking. Employ the 828es as a standalone mixer, or enjoy wireless control from your tablet, smartphone, and laptop. The 828es’s powerful DSP-driven mixer gives you 48-channel mixing, along with a range of great-sounding digital effects. Here’s an interface that offers tons of I/O, premium sound quality, AND extreme flexibility in the modern recording world. 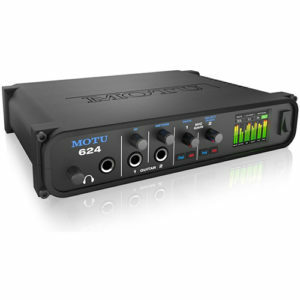 Meet the MOTU 828mk3 Hybrid. This versatile interface offers both FireWire and USB connections, giving you the flexibility to connect to the computers you want. 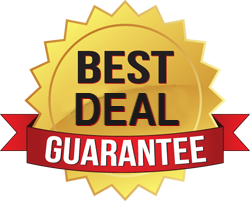 It’s perfect for the recordist who has multiple machines or collaborates with artists and bands. 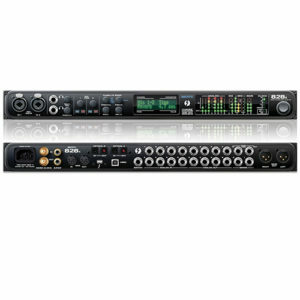 You can feel confident knowing you have the connectivity that will work anywhere, plus a wealth of I/O, including two preamps, to tackle any recording situation!